Monster Hunter: World is a multiplayer game meant to be played online with other people. Unfortunately, matchmaking on Xbox One isn’t yet working as intended. [Update- 7:00pm, 2/1/2018] Capcom patched the game today to fix matchmaking on the Xbox One. While many players have reported it’s now working for them and they’re able to search and join online game sessions, there are reportedly still a few pockets of issues remaining. Every time you start up the game it prompts you to either search for a an online session or create your own. 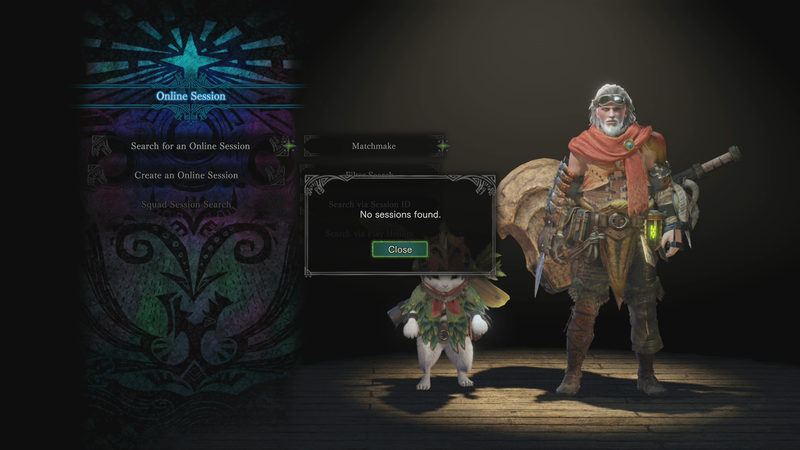 If you want to see other people in your game, and work with them to take down certain monsters, you’ll need to do the former, but currently lots of Xbox One players getting “No sessions found” errors when they try. Reports across Twitter and the Xbox One and Monster Hunter: World subreddits confirm the issue is pretty widespread. Kotaku’s own Mike Fahey tried to go kill stuff with strangers as well and was also thwarted by mysterious gremlins in the game’s matchmaking code. These issues began appearing after Monster Hunter: World released on Friday. A patch updating the game’s online features was also pushed out that day. Then on Saturday, Capcom acknowledged stuff wasn’t working for Xbox One players specifically in a tweet. “Hello Hunters, we’re aware of the Xbox matchmaking issues and dev team is actively investigating it, we’ll update you as soon as we can,” it said. Xbox Support has also noted the issues on its Twitter account in a response to one person frustrated about the situation. So far, neither Capcom or Micorsoft have elaborated on the cause of the issues or a timeline for when they might be resolved. Neither responded to requests from Kotaku for comment. This doesn’t mean the game’s multiplayer is a complete mess. There are workarounds to meeting up with other players, most of them having to do with direct invites of friends and what not. But as in something like Destiny or World of Warcraft, half the fun is encountering weird situations out in the wild and seeing how you can work together with other people to score dinosaur scales or squirrel fangs or whatever other treasure there is to be had. Notably, PS4 players don’t seem to be having this issue, even if PlayStation Network in general has been experiencing technical difficulties of its own throughout the weekend. As a result, there’s been some criticism of the fact that Monster Hunter: World was tested heavily on PS4 through multiple betas while Xbox One was neglected. Of course, it’s not clear whether these issues are something that might have been sorted out through more testing or the result of something else until Capcom shares more information.